Tags: 2018 WSOP, Shaun Deeb. Posted on Monday, June 25, 2018 by "T". 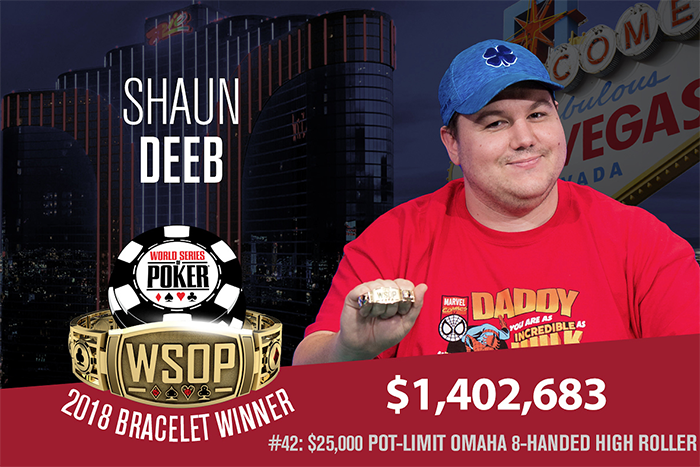 USA's Shaun Deeb, 32, bested a star-packed field in Event #42: $25,000 Pot-Limit Omaha 8-Handed High Roller to claim yet another WSOP bracelet and $1.4 million in prize money! It was the Las Vegas-based online and live poker pro's third WSOP bracelet after winning his first two in 2016 and 2017. Not to forget, the $1,402,683 winner's check is the largest of his career! "It's crazy to get here," Deeb said. "A couple of years ago, I made two PLO final tables but got seventh and eight. I really felt like I got unlucky, but there's such variance - cracking aces, having aces hold, it's everything in this tournament at a final table. I got a great start to the day, got the chip lead, was really never in a bad spot. I was able to control the pot size the way I wanted to in almost every hand. It really helps to not get in an inflated pot with a marginal hand." Among those cashing in Event #42 were Jason Mercier (12th, $77,107), Luis Velador (13th, $63,350), Martin Kozlov (14th, $63,350), Robert Mizrachi (15th, $53,391), Craig Varnell (16th, $53,391), Christopher Frank (18th, $46,190), David Prociak (20th, $46,190), Sam Soverel (24th, $46,190), Mike Leah (25th, $41,049), and Erik Seidel (26th, $41,049). 230 players entered the tournament which created a prize pool of $5,462,500. The top 35 finishers received a minimum cash of $37,500. 9 comments for "2018 WSOP: Shaun Deep Wins Third WSOP Bracelet in $25,000 POT-LIMIT OMAHA 8-HANDED HIGH ROLLER"
was omaha, a game that many like. Last place also paid good with like 5 times the buy in. Well I was rooting for Scotty for this one as he is such a legendry WSOP player but no luck for him. Congrats Deeb for adding an another great win to your career. This tournament was almost full of professional players. This buy in of 25.000 dollars is a huge one for ordinary players. Not all amateurs play here. Instead it can make a few people who have a lot of money but not too many of course. Congratulations to the winner. its huge buy in and ofcourse not so many players can buy in at this kind of tournament!first prize is great,just over 1,4 million dollars,but you need to have this kind of amount and to not regret after if you dont come at prize pool!congratulations to winner! Massive well done to Shaun Deep on winning the $25,000 buy-in high roller tournament and scooping the first-place prize of $1,402,683! He managed to outplay many notable poker players, including Scotty Nguyen, Jason Koon, David Benyamine, at the final table. This is absolutely a noteworthy achievement. It would really be a dream for me to win a bracelet but I know that it's never gonna be a reality for me sadly. I just hope that I can sometime play at least one really big tournament and hopefully be able to cash in it. But that's a long time from now if it ever happens!